Why does Flying Start to Literacy have paired books? Paired books support deeper comprehension of the topic. Flying Start to Literacy uses paired books to enable students to explore the same key concept in a narrative and an informative text. This enables students to think about the topic from different perspectives, and facilitates a much deeper understanding of each topic. It also supports students in making a more ready link between their experiences and the world they are reading about. For vocabulary to be recognised by sight confidently, accurately and fluently, it needs to be read a large number of times. Reading the same words in different sentence structures enables students to develop automatic recall of new vocabulary. It also makes it more likely that the students will go on to use this new vocabulary in discussion, and when they write. As students read each book in the pair, they are presented with different treatments of the same topic. These models of writing enable students to develop a good understanding of how different texts work, and promotes diversity in their writing. 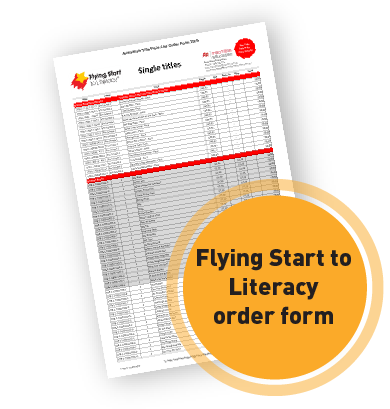 How have the topics in Flying Start to Literacy been selected? Topics addressed in Flying Start to Literacy have been carefully planned to reflect both students’ interests, and the curriculum related to the early years of schooling in the areas of Civics and Citizenship, Geography, Health and Physical Education, History, Science and Technologies. This enables students to learn meaningful information about the world as they are learning to read. Why stage the introduction of the phonic challenges? The relationships between sounds and letters are very complex in English spelling. For example, the letters ch represent different sounds in each of these words (chair, chef, choir). Research shows that to support children as they learn about how phonics works in English, it is helpful to introduce new information about phonics in small steps or stages, so that children are not overwhelmed or confused. 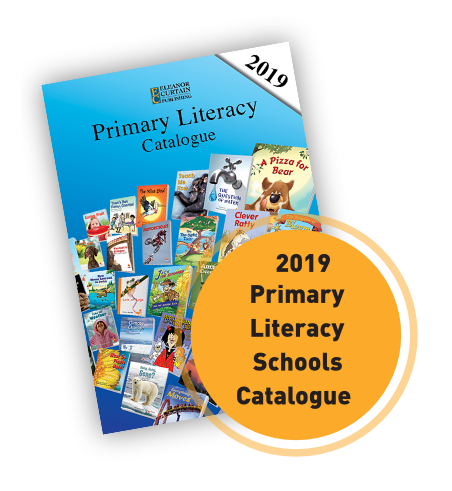 Flying Start to Literacy stages the introduction of new phonic challenges throughout the program to match students’ developing understanding of phonics. This staged introduction of phonics begins with single-letter sound matches (e.g. /a/ as in cat) and progresses through double letters and digraphs (/e/ as in feet), common consonant and vowel representation (e.g. /wh/ as in wheel, /o/ as in boat), and ends with less common representations of sounds in words (e.g. /o/ as in cough). In this way, young readers are supported, and should be able to tackle unknown words using the phonic understandings that they have developed. What do the Developmental Reading Stages mean? The 386 Student Books (152 pairs of books + 16 big books) are organised into 9 Developmental Reading Stages. Each stage introduces new vocabulary (both key content and high-frequency words) and phonic challenges, and consolidates the vocabulary and phonic challenges of preceding stages. As well, each of the 9 Developmental Reading Stages is carefully graded into Guided Reading levels of increasing challenge. This provides a scaffold for students’ reading development. Within each of the 9 stages, levels represent small increments in reading challenge. This is designed to support reading development as students meet new reading challenges. Reading strategies are developed and consolidated at each level. There are 30 Guided Reading levels. To ensure that each book is accurately levelled, careful and extensive in-classroom trialling of each book has been undertaken. The levels are aligned with Reading Recovery levels. 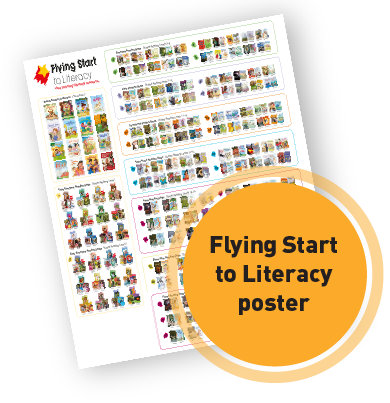 What vocabulary does Flying Start to Literacy introduce? Flying Start to Literacy builds students’ vocabulary in two main areas: high-frequency words; and key content vocabulary. Flying Start to Literacy focuses on developing students’ ability to automatically recognise and use high-frequency words. These are words such as I, and, is, and the that occur with high regularity in reading and writing. The Flying Start to Literacy high-frequency words are based on a comprehensive analysis of Clay (2002); Elley (1989); Fry and Kress (2006); Helman and Burns (2008); Hiebert, Brown, Taitague, Fisher, and Adler (2004); and Dolch sight word list. Key content vocabulary consist of words related to topics. Initially this vocabulary focuses on everyday words that form part of students’ spoken vocabulary. Vocabulary Starters support students as they become familiar with these words. These sets of words provide the basis for Early Emergent Reading Stage books (Levels 1 to 2). From Emergent Reading Stage (Levels 3 to 6) onwards, new key content vocabulary related to each topic is introduced (e.g. the book Spiders uses spider, web, silk, legs, insects). How are new words introduced? in each pair? Approaching a topic as both narrative and informative texts enables the topic to be explored from different points of view. It invites students to go beyond the facts to understand the social context of each topic. It also enables students to combine the intellectual and emotional aspects of each topic, which enriches their understanding of the world, and promotes a broad-based and thoughtful approach to learning about the world. Why does Flying Start to Literacy program include Big Books? What is the purpose of Flying Start Perspectives? The Perspectives books extend students’ thinking with additional points of views on the issues introduced in the paired texts. Flying Start Perspectives is unique. The titles contain short texts in a magazine-style format and include posters, arguments, discussions, letters and visual images.